Me again :) I know you just heard from me on Tuesday, but Erin let me take her spot today because I got the opportunity to review an advance reader copy of Summoner as part of S.D. 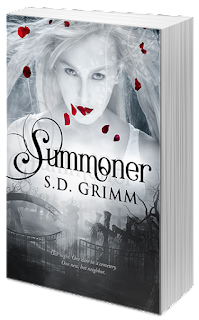 Grimm's blog tour! Yay!! I ended up reading Summoner in only a few days in order to get my review posted on time, but I have a feeling I would have flown through it regardless, because it's just that kind of book! Allie reluctantly accompanies her friends to a cemetery to go "witching" as a dare. But while the others get a little creeped out and laugh it off, Allie hears a spirit calling to her, asking for help. Thus begins a series of nightmares and subsequent visits to the cemetery, in which Allie discovers she's fallen prey to the Summoner's curse, which must be broken before the spirit harms Allie and the ones she loves. In the mix is Cody, Allie's cute new next-door neighbor, who has secrets of his own but will do anything to protect her. I'll admit that ghost stories aren't usually my thing, but I was willing to give this one a try since I highly respect the author both as a person and as a writer :) The creepy factor definitely made me glad I'm rarely home alone at night, but I liked how it all contributed to the mystery of the ghost's intentions and Allie's curse. I also loved how loss was handled in this book. Both Allie and Cody had lost a close family member, the way it affected their mindset and relationships felt very natural and insightful. Despite my reservations about Allie and my occasional confusion about the curse, what really struck home for me about Summoner was the engaging writing style and the beautiful themes of self-forgiveness and loving and living to the fullest. For older teens looking for a well-written romance / ghost story, definitely check this one out! S. D. Grimm’s first love in writing is young adult fantasy and science fiction. She is represented by Julie Gwinn of the Seymour Agency and author of SCARLET MOON. She currently has four books under contract, including the remainder of her YA fantasy series Children of the Blood Moon. When she’s not writing or editing, Sarah enjoys reading (of course! ), practicing kickboxing and Brazilian jiu jitsu, training dogs, and binge-watching shows with great characters. Her office is anywhere she can curl up with her laptop and at least one large-sized dog. 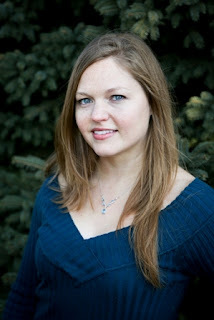 You can learn more about her upcoming novels at www.sdgrimm.com. You can also connect with her on Twitter, Facebook, Pinterest, Instagram, Goodreads, Newsletter, Spotify, and Entangled Publishing. Congratulations on your new release, Sarah!! How do you feel about reading ghost stories? Do you have any favorites? This cover is so eye-catching, & I loved learning more about the story. Thanks for the review, Laurie!